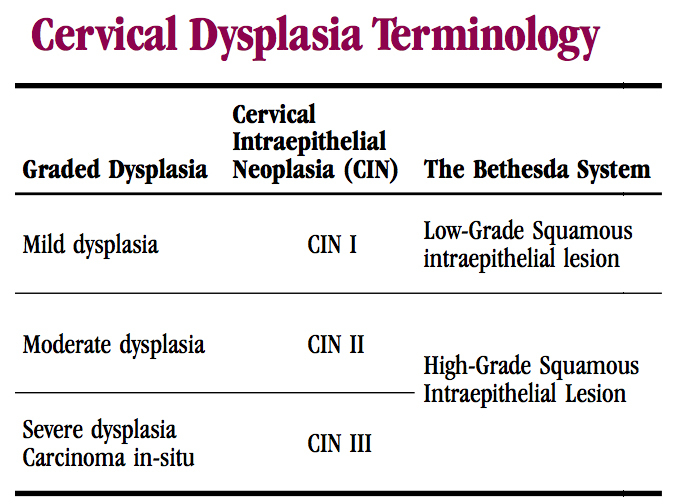 What is Cervical Dysplasia/Squamous Intraepithelial Lesion? A Pap smear is used to look for abnormal cells, and there are various terms used to describe abnormal cellular changes. The term dysplasia is used by many laboratories and doctors and literally means “disordered development.” Dysplasia and its synonyms are considered a precancerous condition that is very treatable. High grade dysplasia (moderate and above HSIL) is considered more serious in its potential to progress and is treated by attempts to remove the abnormal areas from the cervix. Mild dysplasia/LSIL can sometimes resolve on its own, and your physician will discuss with you the type of treatment (if any) that is best for your condition. Pap abnormalities require close follow-up which can be discussed with your provider. From the above chart, it is evident that there are different types of reporting terminology to describe a spectrum of abnormal findings. It is important to understand that the presence of abnormal cells does not mean that a woman has cancer.